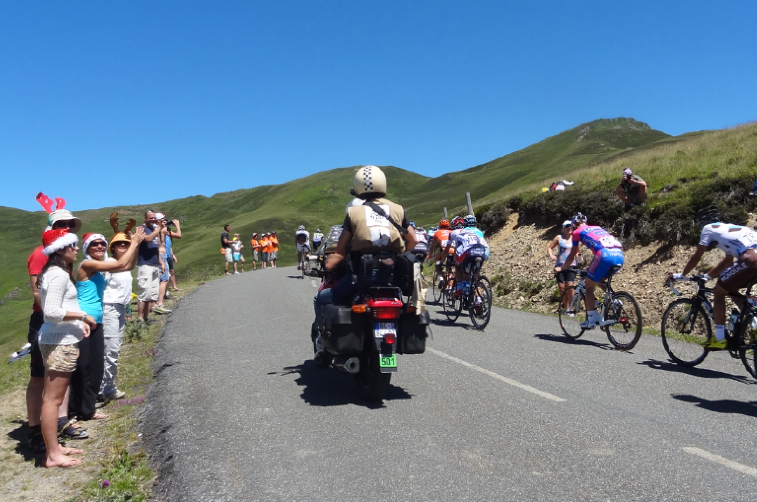 Do I need any other word to describe a day at the Tour de France? 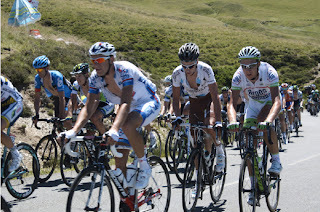 I spent the past five days in the Pyrenees as a tourist, two of those days were spent on mountain stages of the Tour de France, the other 3 days were spent saying statements like, "wow this is beautiful" and "wow this tastes so good" and “this road is steep.” We ate really really really good food and met some very fun people. 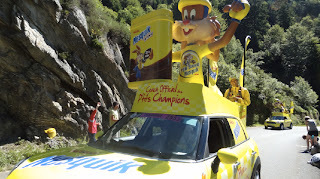 Really, would be my second choice of word to describe a vacation in the south of France. 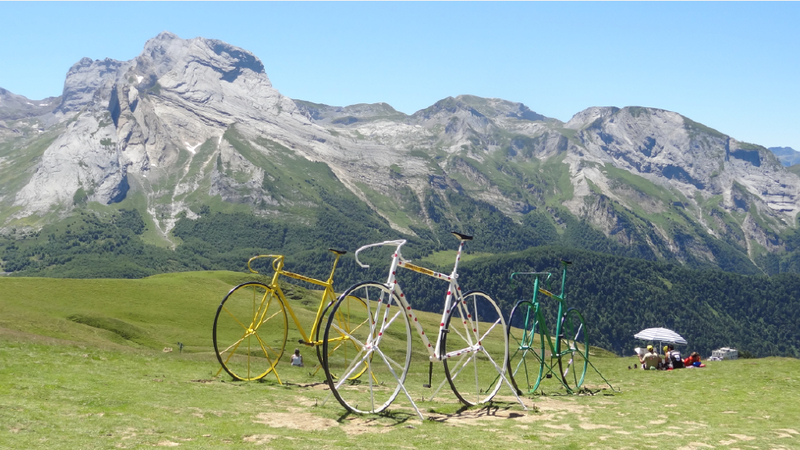 Really fantastic views, really great roads for cycling, really friendly people, really glad I came. Compared to the predominantly French feeling of stages 10,1 1, and 12, I had attended last week in the area of the Rhone River Valley, stages 16 and 17 in the Pyrenees highlighted some of the best climbs in the Pyrenees and had that epic feeling. 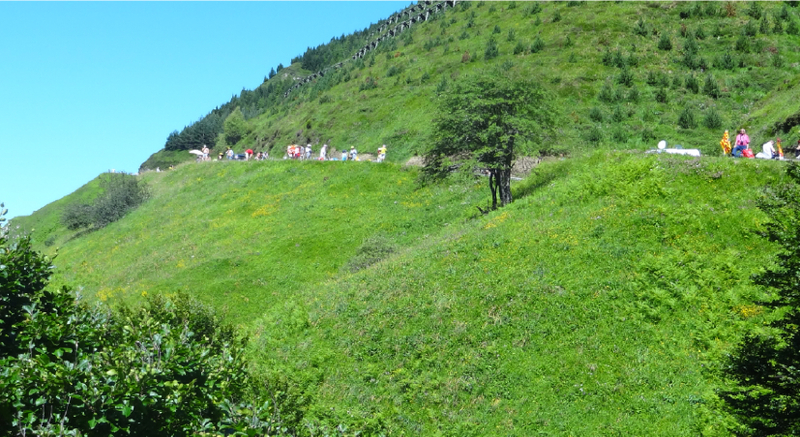 The weather was perhaps the best I had ever experienced on a Tour day (in 6 previous visits). 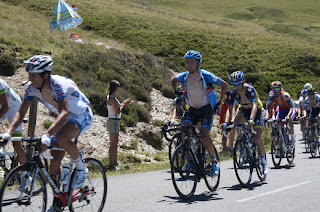 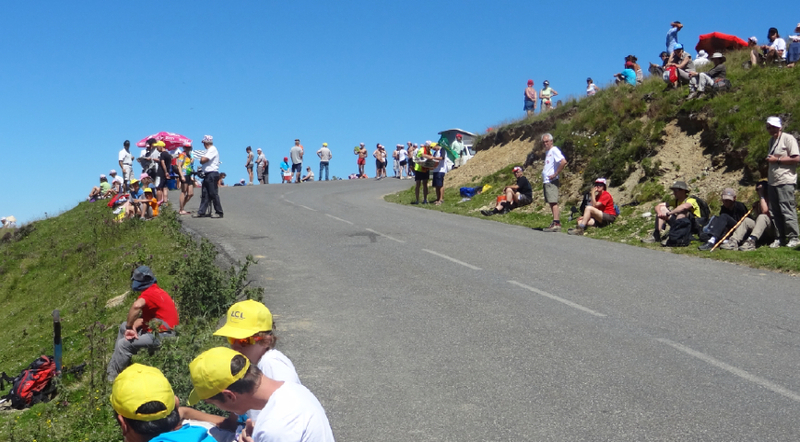 Perhaps Cavendish and Zabriskie would not agree, as they reportedly suffered in the heat, but as a fan, the clear skies made for dramatic views as we sat on a hillside waiting for a pack of riders to pass by. 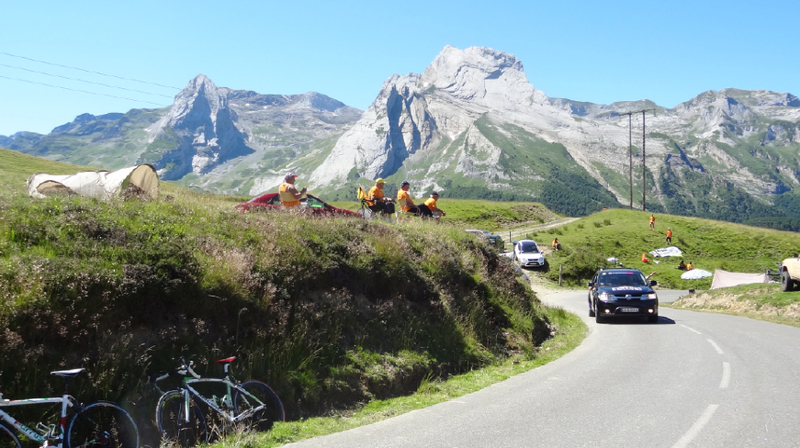 Last Wednesday morning we joined the gathering numbers of cyclists riding the approach up the D934 south of Pau to climb the Col d' Aubisque. This road is commonly included on the route of the Tour and happens to run directly below the sauque (farm) where we are staying in the Vallee d'Ossau. 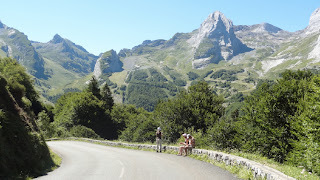 To understand the Pyrenees one must grasp the idea of various valleys running south into a huge mountain range stretching west to east and dividing France from Spain. 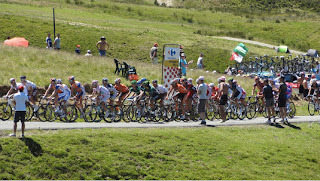 To understand the Tour de France, one must grasp the idea that these valleys mean nothing to a cyclist who must traverse 5 valleys in one stage and never get the chance to sit and enjoy the view, eat a grilled sausage sandwich from a local food vendor, giggle over trinkets thrown from an entertaining caravan, or have the opportunity to stop and snap photographs along the beautiful route. 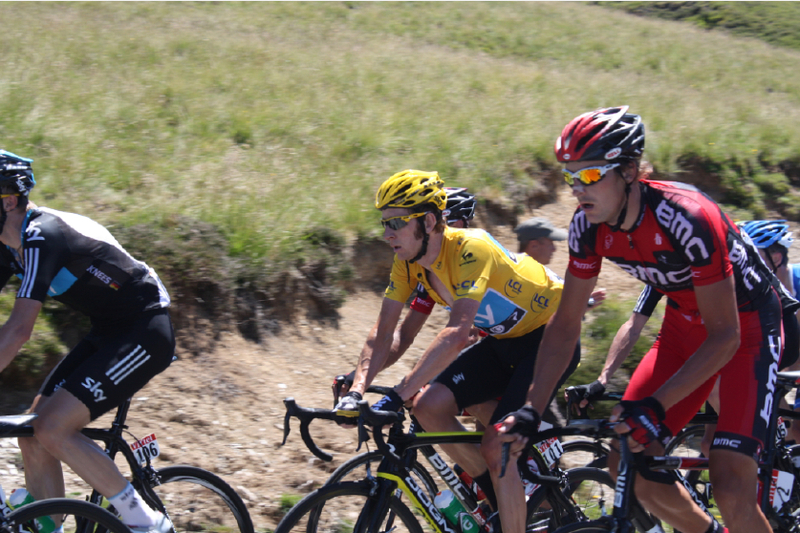 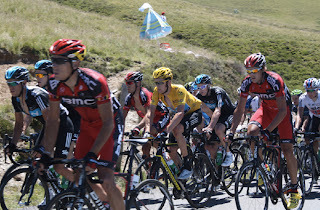 Cycling on the route of the Tour de France is like getting to play a scrimmage game with your best friends on the football field before the Superbowl and then meeting fans from around the world who are there to do the same thing and then getting to stand on the sideline and watch. 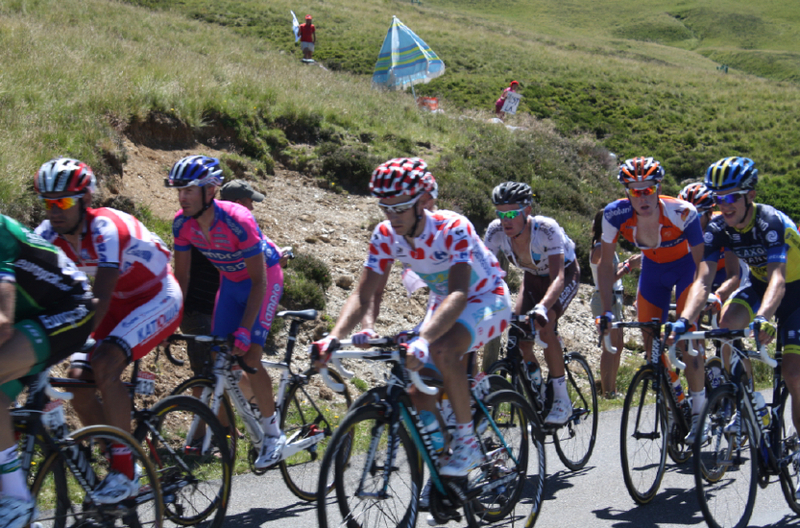 The only goal of a fan is to have a good time, under good weather, and cheer on their favorite riders. We got to do all of that. We were so excited we woke early to begin our ride up the mountain, we did not want to be blocked by the Gendarmes, which is sort of par for the course. 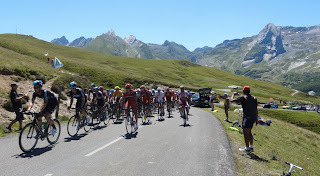 The Col d’Aubisque was tricky since it was the first of 4 significant climbs of the day and the caravan would pass by 2 hours prior to the riders. 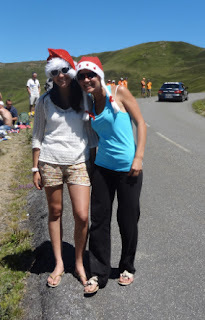 We had no idea what to expect, we only wanted to be there to participate. 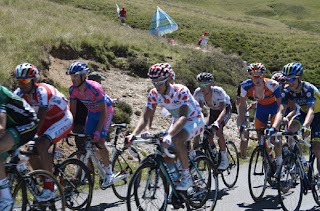 We continued pedaling, up and up, receiving cheers are we rode past surprised fans. Never once did it occur that we were doing something extraordinary, we are cyclists from Colorado, where half the riders are women. 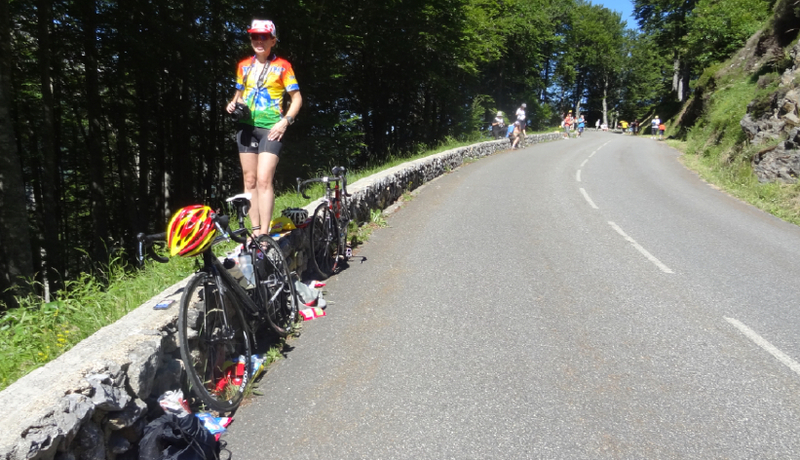 But here in France, it is a rare sight to see women riding epic climbs. 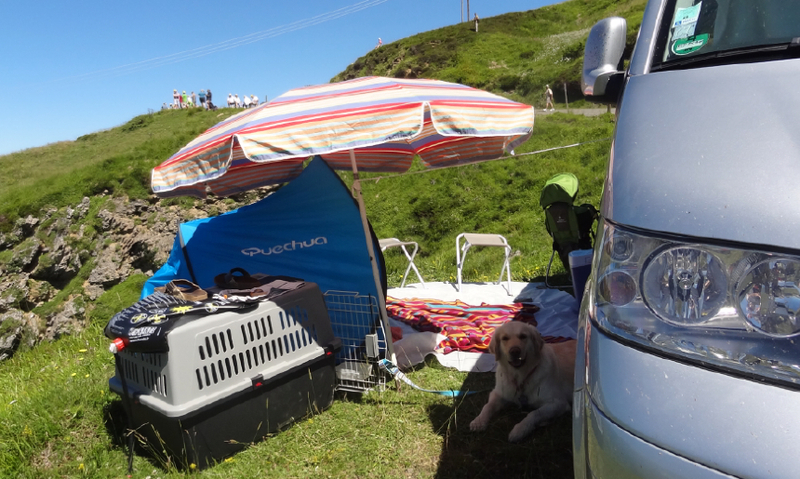 Two days later we met 2 women from Florida who were here to do the same thing. 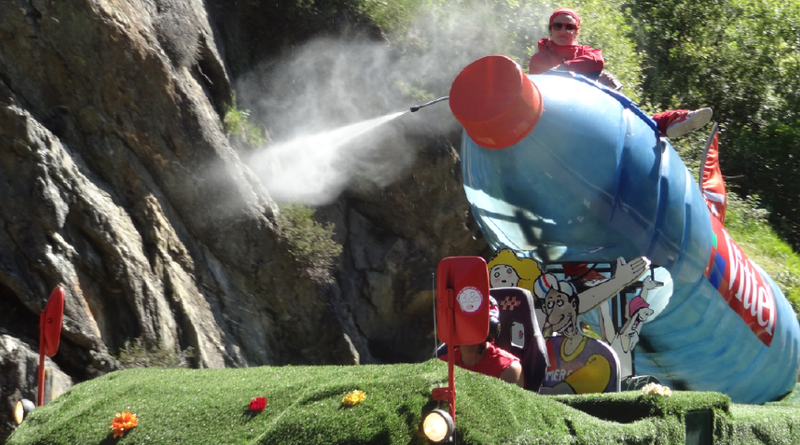 When they told us they traveled all this way to ride onto the route of the Tour de France, we responded, “wow that is so cool,” but wait, we were doing the same thing! 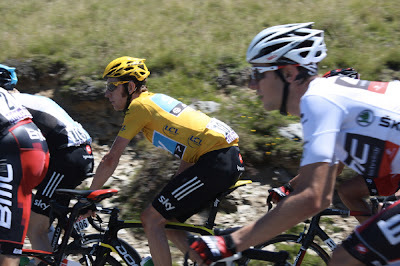 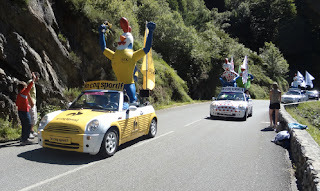 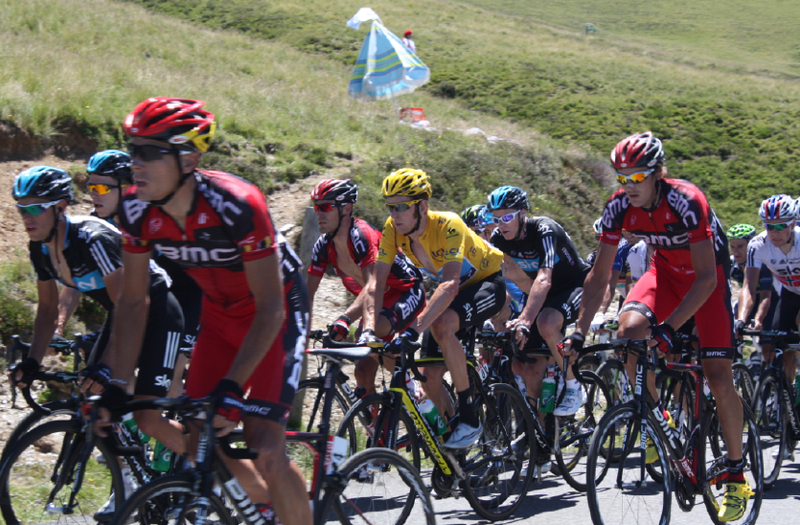 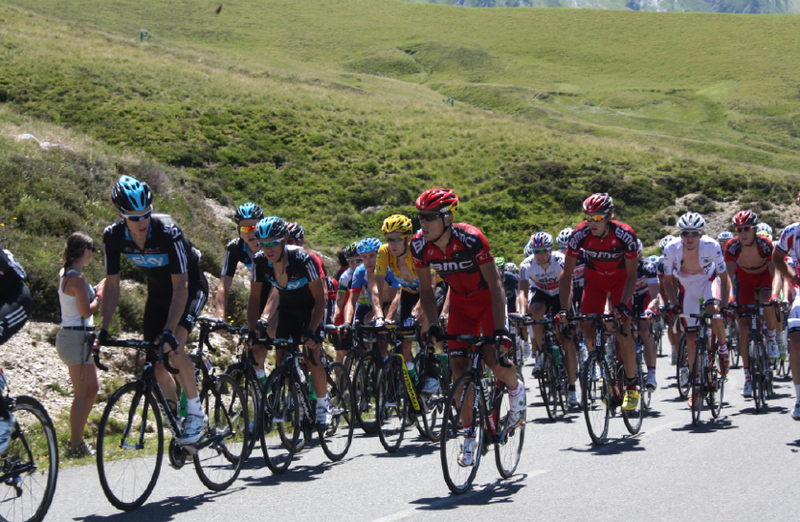 The Tour de France is a grand organized chaotic exciting festival. A day of people helping people, offering pushes up the hill, sharing caravan swag, allowing passage on the descent, laughing and smiling no matter what your country or language. 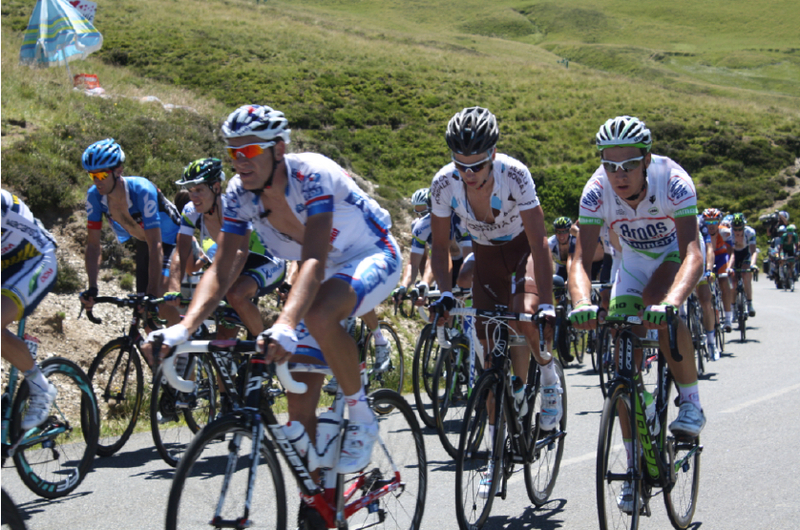 The experience as a fan melds well with the goal of teamwork of the pro riders. 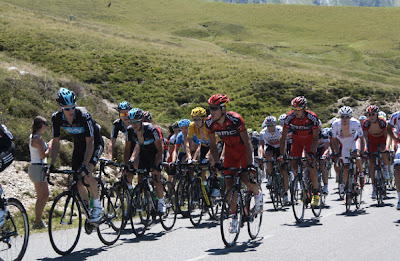 To me the Tour de France is people, then sport, and then scenery. We rode, we walked, but we got to the top of that mountain. 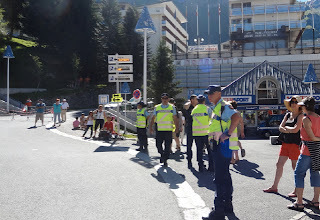 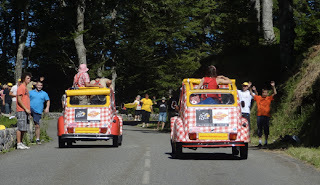 Those Gendarmes let us by, but not until we engaged them in various honest conversations explaining - yes our cycling shoes were in our napsacks, but our flip-flops were on our feet. No, we would not put back on our cycling shoes after passing the Gendarmes because we were content to walk up the Col d’Aubisque rather than ride up it (actually much harder), nor would we de-flat our tires (as they suggested) to prove our intent. 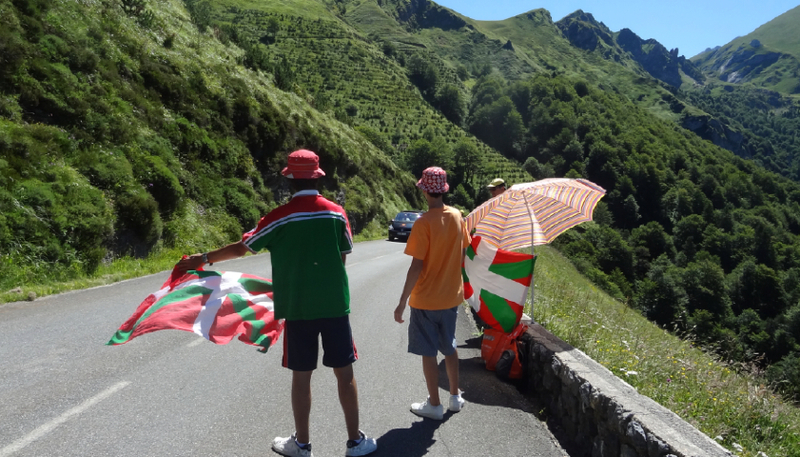 The Gendarmes would have to trust that we were experienced flip-floppers on 9-10% grades. 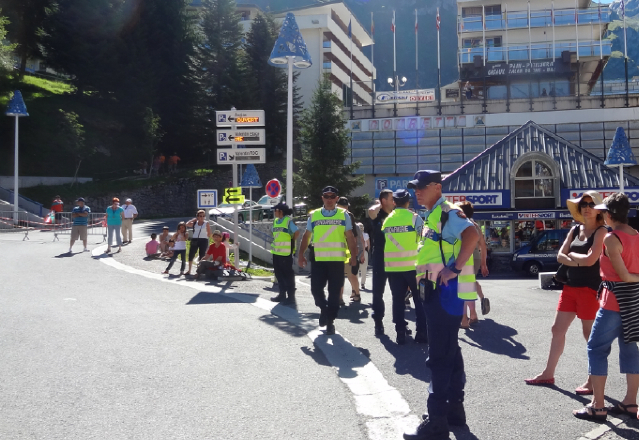 Negotiating with a Gendarme is a subjective art form in France. 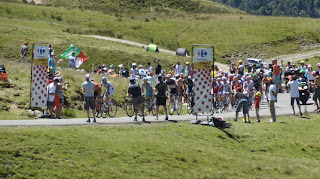 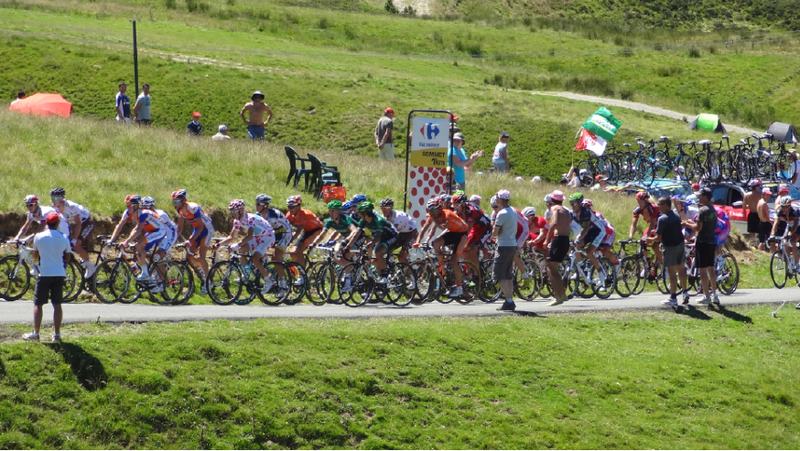 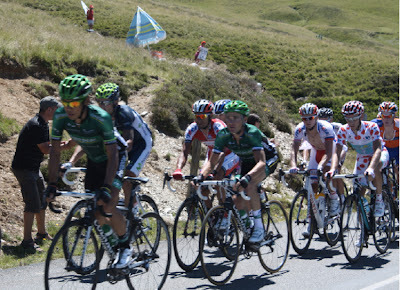 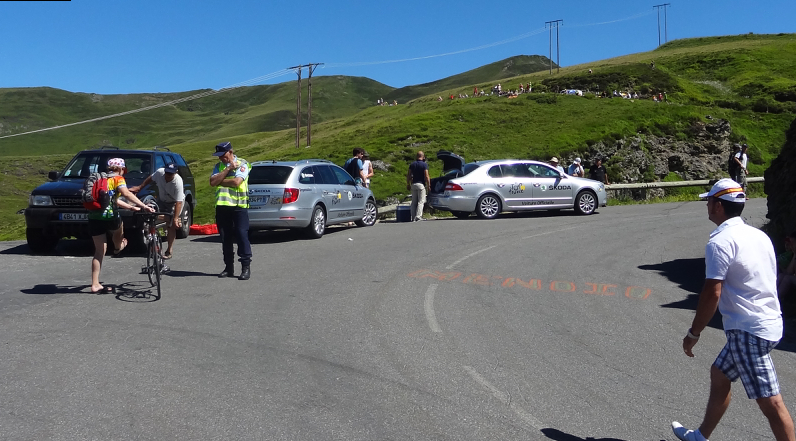 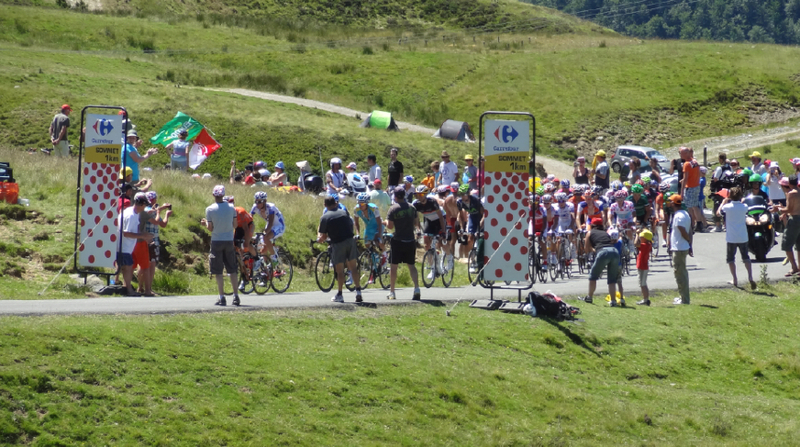 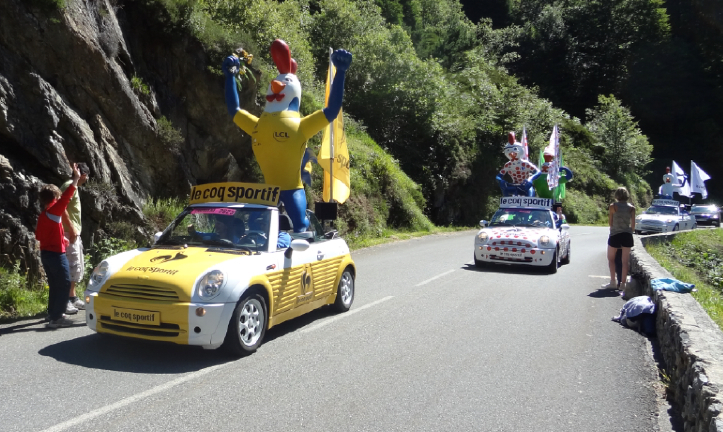 The Tour de France riders got to ride up the Col d’Aubisque. 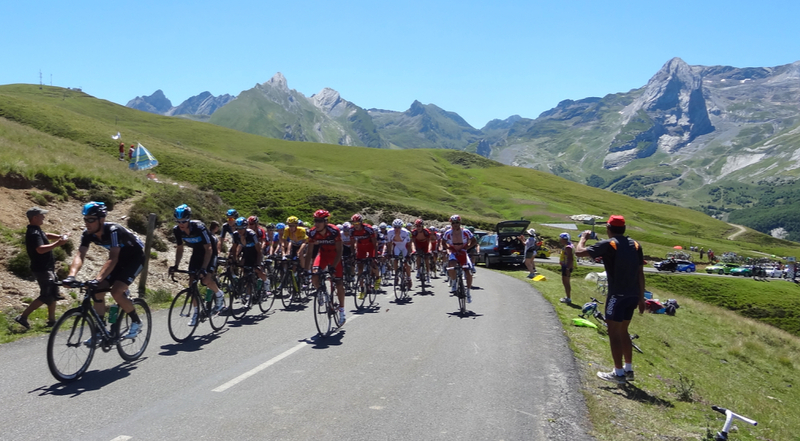 On Stage 16 of the Tour de France, they rode up the Vallee d’Ossau to climb the Col d'Aubisque (Col #1), across to the Col du Soulor, down to the Valley Lavenden, up the Gorge de Luz, up the Col du Tourmalet (Col #2), down to the Adour River, up the Col d'Aspin (Col #3), down to the town of Arreau in the Vallee d’Aure, up the Col de Peyresourde (Col #4), and finally descended into the spa resort of Bagneres-du-Luchon to an entirely new outcome of the Tour de France. 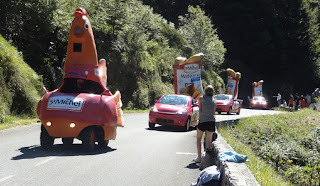 Well no wonder after all of that. 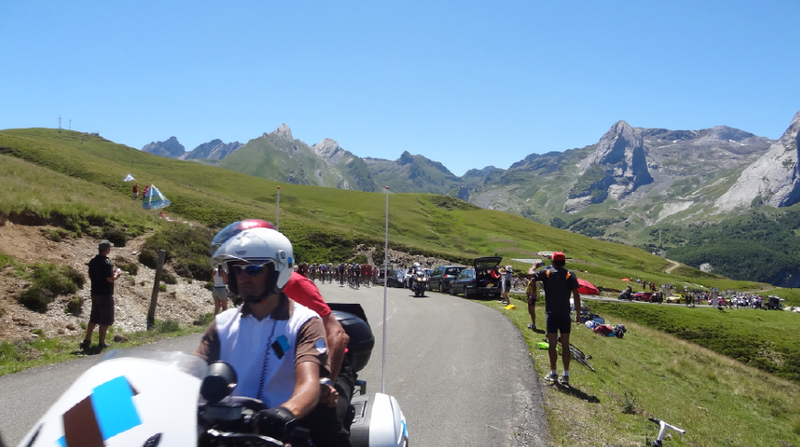 Meanwhile after watching the riders pass by, we had a short pedal to the top of the Col d’Aubisque where we enjoyed a grilled sausage sandwich and a cold drink at the café while watching the Tour proceed on TV. Our biggest concern was carting back our huge stash of caravan loot and wondering where our next baguette would be found. Being a fan is easy. I want to let the riders know that the fans have an incredibly good time out there waiting for their over-heated high wattage bodies to ride by. Thank you for providing us with a great excuse to wile away the day on a beautiful mountainside in France. We came home to sleep and do it all over the next day, during a totally different experience on Stage 17 at Peyregudes (tons of fun). 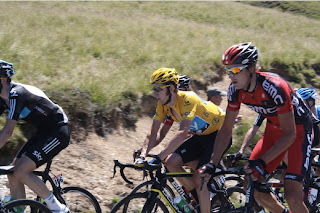 For now photographs from being a fan at Stage 16 of the 2102 Tour de France: Thomas Voeckler won the Stage! This was the scene on just one of the Cols - can you imagine the others? 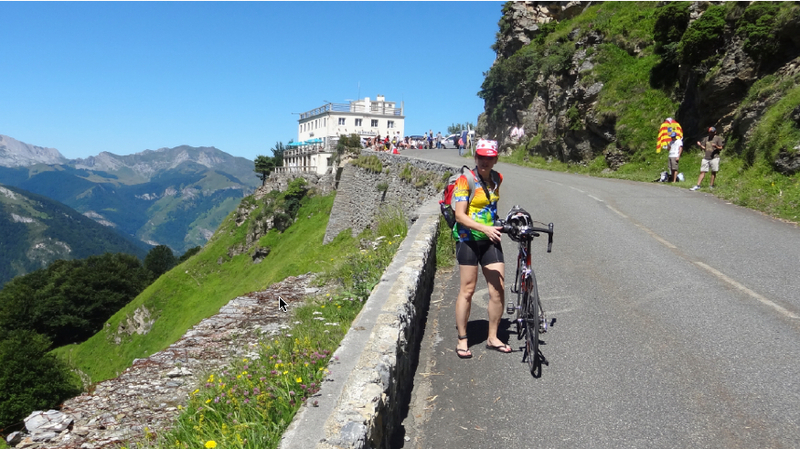 Monica proving she will wear her flip-flops (thongs for you Aussies) up the Col d'Aubisque. 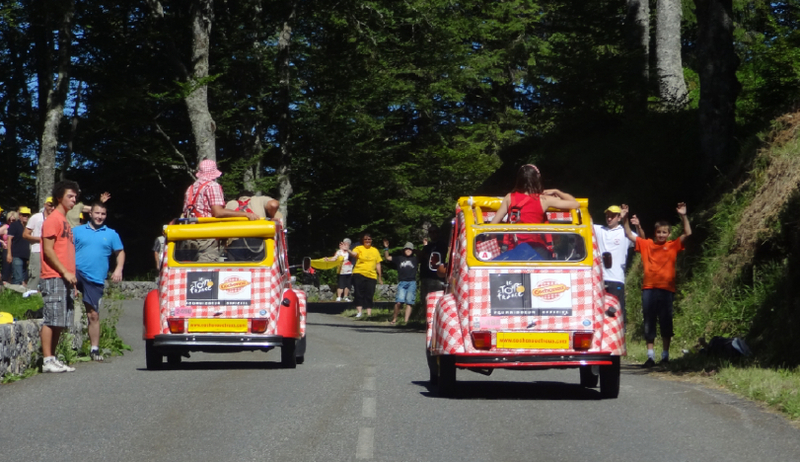 So what's up from France?